We love doing fun science experiments at home. The best kind are when they involve supplies that we already have at home. This one was similar too the Lava Lamp we made, except it is cheaper to do, as it uses less oil and there is no need to buy expensive alka seltzer. 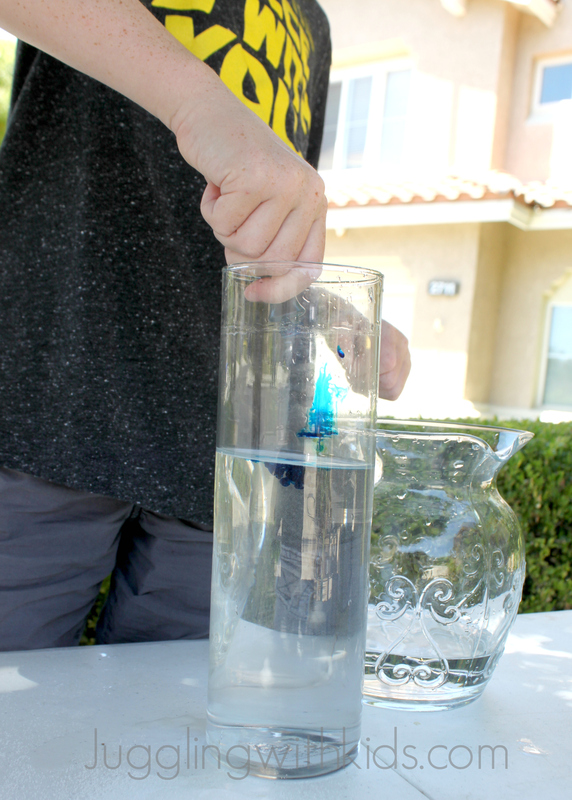 We found this fun activity on Cool Science Experiments Headquarters blog. If you would like to see a video version of this blog post, please check out the video my son edited at the very bottom of this post. Fill your vase or jar with water about 2/3 of the way full. This next part is optional, but we decided to add a bit of food coloring to our water. Then pour oil into your vase or jar. Make sure to leave about an inch or more space left at the top (since you’ll be adding salt, you don’t want the oil to overflow). Let the oil and water to sit until they have completely separated. This alone is a cool experiment for children to observe how oil and water do not mix. Next add a couple of tablespoons of salt. And then you will see bubbles begin to rise to the top. Continue to add more salt to create more bubbles. Where did the bubbles come from? When you add salt to your vase, the salt takes some oil with it to the bottom of the vase. As the salt begins to dissolve in the water, the oil that was taken down with it, is released and travels back to the top (because oil and water do not mix). How cool is that? Here is the awesome video my son edited for me. Enjoy! This is VERY cool! How long do the bubbles last or do they just keep forming?